When the Jewish leaders objected to the celebration of Christ’s entry into Jerusalem on Palm Sunday, Jesus commented that if the people did not proclaim Him as the Lord and Messiah even the “stones would immediately cry out” (Luke 19:40). Well, in this day of denial of the enormous evidence for the accuracy and authority of the Bible, Brian Thomas’ article on the silent advocates is a real-life example of the very stones shouting the veracity of God’s Word. Brian is fast becoming an expert on the soft tissue evidence from the stones of Earth where long-dead creatures are crying out on the judgment of the great Flood of Noah’s day. The effort to silence the stones’ voice has been long and intense, but as we unearth more and more examples they continue to speak more loudly than ever before. Enjoy this informative article and pass it on to others. His words sound familiar. Almost without fail, whenever an ICR scientist discusses original tissue in fossils, we hear well-intended explanations of how we got it all wrong—that the fossils in question are actually made of minerals. But they are not all mineral—that’s the primary point of the technical articles reporting these discoveries. Why do so many have such a hard time accepting these clear observations? Perhaps if more people knew about original-tissue fossil discoveries, they would better understand what fossils really represent. Evolutionists frequently use the fossil record as “proof” that Earth’s history stretches back millions or even billions of years. The overwhelming majority of fossils are mineralized remains or impressions of once-organic, long-dead creatures. Maybe those mineralized fossils could last that long, but that’s not the issue we’re addressing. A completely different class of fossils holds remnants of animal biochemicals like proteins, pigments, and DNA that minerals never replaced, and lab tests indicate that these organic tissue components could not last a million years—that’s what we’re talking about. Interestingly, the concept of millions of years of “deep time” grew in popularity even as original-tissue fossils were being discovered and described. Deep time refers to a practically endless series of events that supposedly occurred before the appearance of man in the world. Even locked in rocks, original tissues shouldn’t have lasted from way back then until now. How Did Deep Time Enter the Culture? Prominent secular thinkers wove the theory of deep time into Western culture centuries ago. In 1788, Scottish geologist James Hutton suggested that today’s slow and gradual processes might explain past geologic features. His “Theory of the Earth” paper concluded, “The result, therefore, of our present enquiry is, that we find no vestige of a beginning,—no prospect of an end.”2 But did his “result” come from the data or from a preferred way to interpret those data? Scottish lawyer Charles Lyell borrowed from Hutton when he wrote his immensely influential book on deep time Principles of Geology. He called them principles of geology, but they’re actually arbitrary. For example, he assumed present, slow processes required deep time to form immense rock layers. He ignored evidence for recent and rapid deposition of those layers, including fossils and a lack of expected scars between layers from deep time’s erosion. Lyell wrote a letter to a friend saying, “Free the science from Moses” by having gospel ministers “see at last the mischief and scandal brought on them by Mosaic systems.”3 “Mosaic systems” clearly refers to Moses’ books—especially Genesis. Perhaps nobody will ever know why Lyell thought Genesis was mischievous or scandalous, but we do know that he labored to completely replace Genesis history with deep time. In the late 1700s and early 1800s, leading anatomist Georges Cuvier expertly interpreted the anatomies of fossil bones but explained them in terms of deep time. His writing influenced creation scientists like England’s Sir Charles Bell, who in the 1830s wrote a whole book on the human hand. 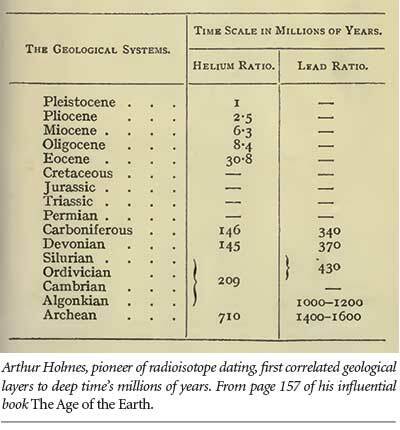 When comparing hands to fossil limb bones of different creatures, Bell admitted, “Not merely do we learn that individual animals…existed at those distant periods: but even the changes which the globe has undergone, in time before all existing records, and before the creation of human beings to inhabit the earth, are opened to our contemplation.”4 This non-Genesis time concept came from the pen of a man convinced of creation, but not biblical creation.5 Deep time, fully entrenched in Western thinking for generations, eventually provided Charles Darwin an expansive canvas upon which to conceive his stories about evolution. When Were Original-Tissue Fossils First Uncovered? Ironically, however, all this time soft tissue fossils were silently advocating for recent, biblical creation. This Genesis perspective, alive but marginalized even back then, held that rocks and fossils should be interpreted in light of the historical Flood of Noah. Recent, widespread flooding, not deep time, explains many fossils—such as the ones England’s famous geologist Mary Anning found in the eroding cliffs near her hometown of Lyme Regis. Mary found ammonites, fish, the first ichthyosaurs, and the first pterosaur in England, as well as fossil cuttlefish, which like squid can secrete ink when threatened. Referring to Mary’s fossils, Charles Dickens wrote, “Some of them are so perfect that the ink-bag has been found and ‘utilised.’”8 That is, utilized as ink. As reported on icr.org, researchers in 2009 recovered ink from a fossil squid ink-sac found in Trowbridge, UK. They actually wetted its dried ink and drew a picture of what the creature looked like when it was alive.9 Chemical analysis later confirmed the fossil and cuttlefish ink pigments as being virtually identical, but how could this chemical have remained unchanged 150 million supposed years?10 Because the pigments are organic compounds that bacteria could consume and with which oxygen reacts, we would never expect them to persist for tens of millions of years. But that’s not all Mary found. She also found well-preserved eye lenses of an Ichthyosaurus, an extinct marine reptile. Dickens wrote, “Thus was brought to light the first Ichthyosaurus (fish-lizard), a monster some thirty feet long, with jaws nearly a fathom in length, and huge saucer eyes, some of which have been found so perfect, that the petrified lenses (the sclerotica, of which it had thirteen coats) have been split off and used as magnifiers.”11 As “magnifiers,” light could pass through the lenses, so were they really petrified? It is difficult to imagine that these lenses are actually transparent minerals that replaced the original organic tissues. What if they had naturally mummified, or dried down, like the cuttlefish and squid inks? 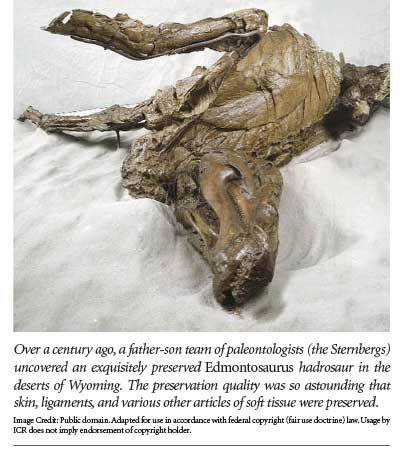 In 1908, famous American fossil hunter Charles Sternberg and his sons uncovered in Wyoming the first of two of the world’s best-preserved dinosaur remains—naturally mummified hadrosaurs. The placard beside a replica of the “Senckenberg mummy” in the Black Hills Museum of Natural History quotes Sternberg’s description of “the skin preserved with its complex arrangement of minute scales and clinging to the bones.” He did not use today’s sophisticated techniques to identify specific proteins, but his word choices more easily match the “original tissue” phrase that modern researchers continue to use as they verify proteins and tissues in supposedly ancient fossils. In 1914, Barnum Brown described mummified Corythosaurus. They had muscles and tendons. Whether or not these tissues were original and not mineralized remains to be verified, but modern biochemical techniques have since confirmed many other animal proteins in fossils, opening the possibility that these mummies were not mineralized. So, Sternberg saw the freshness of his fossils but, like today’s secular researchers, did not let it challenge his deep-time dogma. However, like Charles Bell and so many others before him, Sternberg openly discussed creation (though not biblical creation). 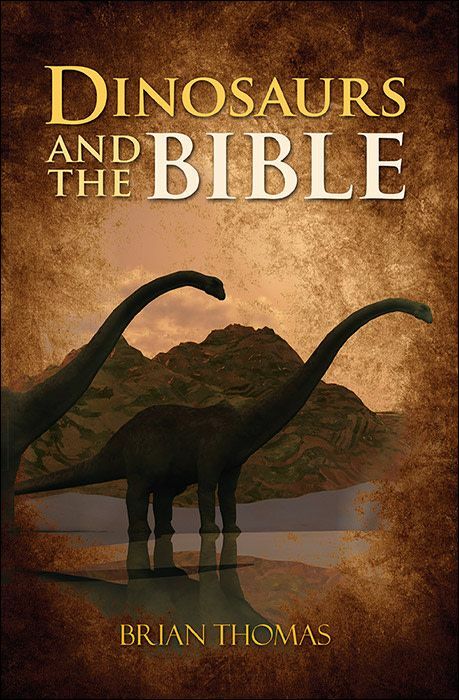 In his 1917 book Hunting Dinosaurs, Sternberg wrote, “The creatures of the misty past are before them; God’s creatures, for if he cares for the raven, for the fall of a sparrow, he must have cared for the creatures of his hand, that existed so many ages before man appeared—these lords of creation, that domineer over God’s green earth.”14 How could Sternberg’s presumably non-mineralized hadrosaurs have persisted throughout so many ages of a “misty past”? Dried tissues like skin and even bones simply don’t last that long. These discoveries reveal an important conclusion: Secularists have maintained the dogma of deep time even as they continue to encounter original-tissue fossils that directly challenge that kind of thinking. Remember the person who responded to ICR’s fossil-protein report? He explained that if people would just read the “actual paper from the scientists that made this discovery and not just some website,” they would discover that all these tissues were actually mineralized and not from the original animal. But we’ve seen all kinds of documented soft-tissue discoveries from numerous unmineralized fossils! 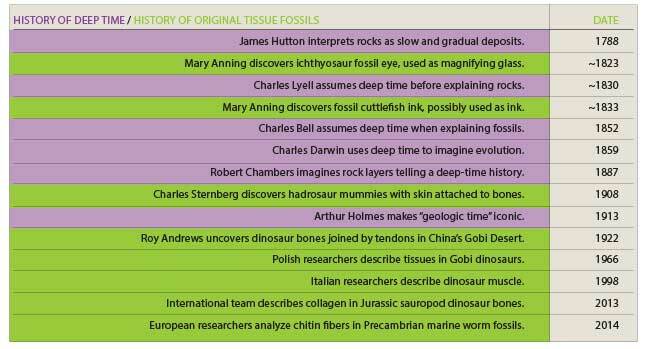 We can understand why the ICR responder, like so many others, seems eager to deny that fossils contain original tissue. After all, the idea that fossils formed millions of years ago comes from a long line of deep-time advocates. A willing and investigative spirit is required to reckon with the evidence that challenges these old traditions. The science of original-tissue fossils confirms the globe-covering Flood judgment that occurred only thousands of years ago just as Scripture says. It’s time to listen to the thundering cries of biblical creation’s silent advocates. Thomas, B. Still Soft after Half a Billion Years? Creation Science Update. Posted on icr.org May 5, 2014, accessed June 24, 2014. Hutton, J. 1788. Theory of the Earth. Transactions of the Royal Society of Edinburgh, 96. Letter to Poulett Scrope, June 14, 1830. Lyell, C. 1983. Life, Letters, and Journals of Sir Charles Lyell, Bart, Volume 1. New York : AMS Press, 268. Bell, C. 1852. The Hand: Its Mechanism and Vital Endowments as Evincing Design, 5th ed. London: John Murray, 88. Biblical creation not only admits that God—outside the world—made the world, but that He did it exactly the way He describes in Genesis. Bell wrote in The Hand, “What makes us so unwilling to admit such an influence [a Designer], in the last grand work of creation, the introduction of man? We cannot resist these proofs [from studying anatomy] of a beginning, or of a First Cause” (ibid, 265). He accepted the God, but not all the words, of Genesis. Chambers, R. 1887. Vestiges of the Natural History of Creation. London: George Routledge and Sons, 42-43. Holmes, A. 1913. The Age of the Earth. London: Harper & Brothers, 157. Dickens, C. 1865. Mary Anning, the Fossil Finder. All the Year Round: A Weekly Journal, Volume XIII. London: Chapman and Hall, 62. Thomas, B. Fresh Jurassic Squid Ink. Creation Science Update. Posted on icr.org August 27, 2009, accessed May 28, 2014. Glass, K. et al. 2012. Direct chemical evidence for eumelanin pigment from the Jurassic period. Proceedings of the National Academy of Sciences. 109 (26): 10218–10223. Dickens, All the Year Round, 61. Thomas, B. 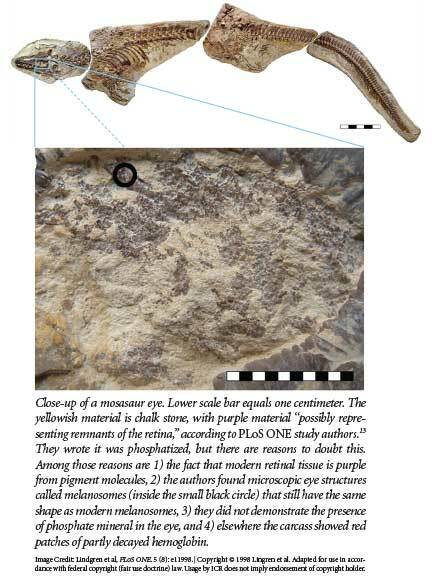 ‘80 Million-Year-Old’ Mosasaur Fossil Has Soft Retina and Blood Residue. Creation Science Update. Posted on icr.org August 20, 2010, accessed May 26, 2014. Lindgren, J. et al. 2010. Convergent Evolution in Aquatic Tetrapods: Insights from an Exceptional Fossil Mosasaur. PLoS ONE. 5 (8): e11998. Sternberg, C. H. 1917. Hunting Dinosaurs in the Bad Lands of the Red Deer River, Alberta, Canada: A Sequel to The Life of a Fossil Hunter. Lawrence, KS: The World Company Press,125. Andrews, R. C. 1953. 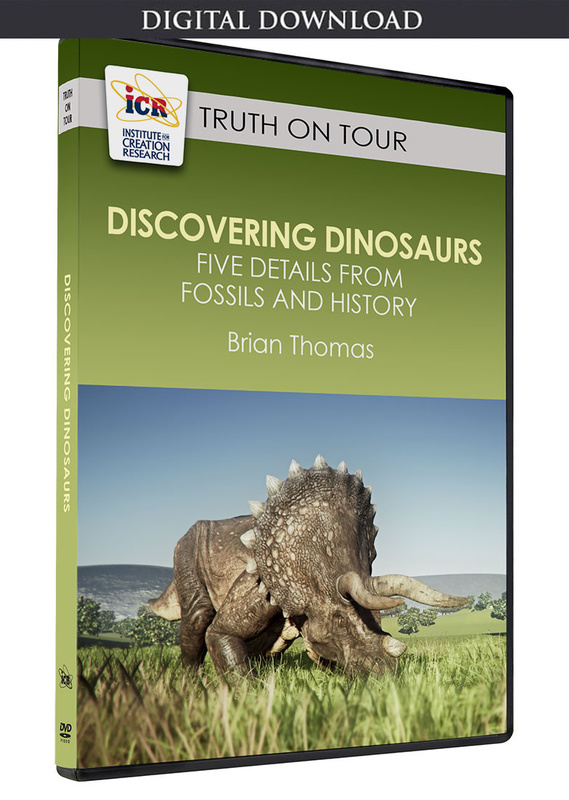 All About Dinosaurs. New York: Random House, 101. Pawlicki, R., A. Korbel, and H. Kubiak. 1966. Cells, Collagen Fibrils and Vessels in Dinosaur Bone. Nature. 211 (5049): 655-657. Hebert, J. 2013. Rethinking Carbon-14 Dating: What Does It Really Tell Us about the Age of the Earth? Acts & Facts. 42 (4): 12-14. Dal Sasso, C. and M. Signore. 1998. 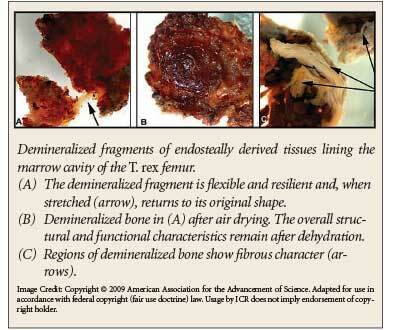 Exceptional soft-tissue preservation in a theropod dinosaur from Italy. Nature. 392 (6674): 383-387. Schweitzer, M. H. et al. 2014. A role for iron and oxygen chemistry in preserving soft tissues, cells and molecules from deep time. Proceedings of the Royal Society B. 281 (1775): 1471-2954. Buckley, M. and M. J. Collins. 2011. Collagen survival and its use for species identification in Holocene-lower Pleistocene bone fragments from British archaeological and paleontological sites. Antiqua. 1 (1): 1-7. Schweitzer, M. H. et al. 2013. Molecular analyses of dinosaur osteocytes support the presence of endogenous molecules. Bone. 52 (1): 414-423. Reisz, R. R. et al. 2013. Embryology of Early Jurassic dinosaur from China with evidence of preserved organic remains. Nature. 496 (7444): 210-214. Bergmann, U. et al. 2010. Archaeopteryx feathers and bone chemistry fully revealed via synchrotron imaging. Proceedings of the National Academy of Sciences. 107 (20): 9060-9065. Cody, G. D. et al. 2011. Molecular signature of chitin-protein complex in Paleozoic arthropods. Geology. 39 (3): 255-258. Moczydlowska, M., F. Estall, and F. Foucher. 2014. Microstructure and Biogeochemistry of the Organically Preserved Ediacaran Metazoan Sabellidites. Journal of Paleontology. 88 (2): 224-239. Cite this article: Brian Thomas, Ph.D. 2014. 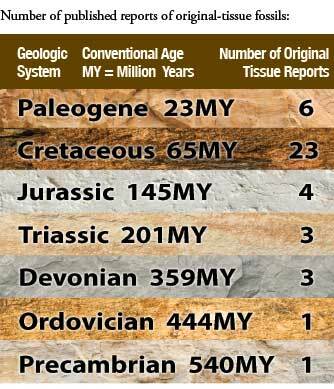 Original-Tissue Fossils: Creation's Silent Advocates. Acts & Facts. 43 (8).